We love a good road trip! When it makes sense to drive we like to take advantage of the freedom that comes with driving and we explore off the beaten path. The hard part is keeping everyone entertained on longer drive days. The kids keep themselves busy with toys and books. We throw on audio books or podcasts for everyone to enjoy. Jeff does most of the driving (Jeff edit: all) and even with three kids to help I find that I usually have time for some easy crafting. This is where a good road trip craft comes in. I’ve been pinning lots of embroidery projects on Pinterest, but am a bit out of practice. 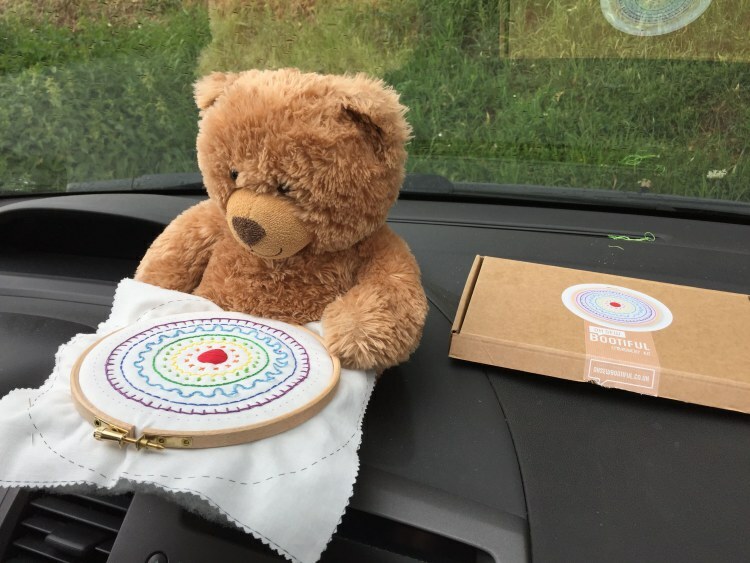 I decided to give Oh Sew Bootiful’s Modern Rainbow Embroidery Kit a try on our first road trip of the summer. These kits are perfectly small and come with almost everything you need to complete the craft. I checked my box when it arrived, threw in a small pair of scissors and put it in the car bag for the trip. I was excited to get started but the first few hours in the car were pretty mom intensive. So when things calmed down, the Dutch stories were on and the kids were finally quiet I started sewing. When we got to our first stop of the road trip I had already completed two colors. Each circle reviews (or teaches) a different embroidery stitch. I ran into some trouble on the French knot, which I had never quite figured out. With a bit of coaching from a friend while I sat in a car with sleeping kids, I managed to master the French knot! Day two started off with a two-hour drive. The kids were calm and reading so I knocked out a few more rows. The project is simple so it was easy to chat with Jeff while I worked. Goodbye Bear, who helps the kids with transitions, even lent a hand. He watched over my hard work while we explored a barefoot hiking trail in Germany. The kids loved watching the progress. They kept asking to see it and feel it each step of the way. The Big Little asked for all my thread scraps, which he made into bracelets for everyone’s lovies. I honestly thought it would take me longer, but I was done by day two! We used the remaining thread to make family friendship bracelets. The finished hoop was all I needed to hold on to, and it easily slipped into an interior pocket of the suitcase.